Dont wake up my heart boy. when I cant hear it weep. disturbed by anguish or elation. you dont need to wake my heart up. it wont do me any good. GiddyBird, this is a wonderful poem filled with palpable self-realization and desire that is akin to the quest of Pinocchio or the Velveteen rabbit towards realness (and away from sameness). 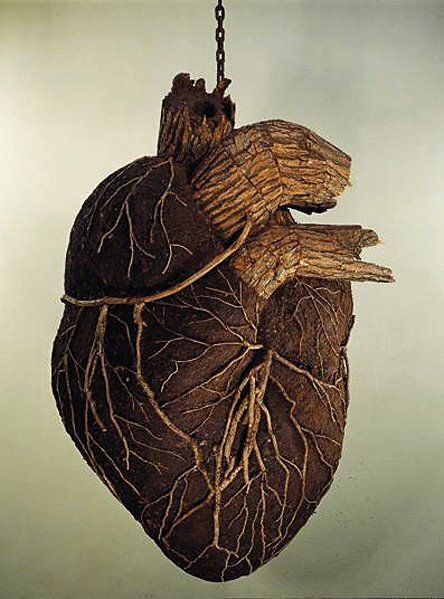 By coincidence, I just saw this wooden heart artwork in the latest issue of Conservation magazine. The associated article was about how the invasion of the emerald ash borer beetles has been linked to a rise in human cardiovascular and lower respiratory tract diseases. Don’t you love the multivalent nature of art and art of nature? Awesome praise – thankyou very much. I love the “links” we stumble across. I didn’t know that about beetles and hearts, but will research it ow.